Guess what. I am getting old. I have entered a phase in parenting that is kind of mind blowing for me. Advice that was given to me when Brayden was a baby is now outdated. And it has changed a few times. When Brayden was a baby, the recommendation was to start solids at 4 months old. You did it slowly over time. There were a lot of restrictions on what could be given at what ages because you didn’t want to cause food allergies. Things were the same for Kaitlyn, though some were starting to suggest waiting until 6 months for solids. When McKenna was a baby, there was starting to be some questioning as to whether previous recommendations were really the right way to go or not and things were sort of up in the air. Today, things are very different. And that leads me to this post. I have quite a few posts on solids, but all of the “how-tos” were written almost 5 years ago and are pretty much obsolete now. Foods that we were supposed to avoid because they would cause food allergies we are now supposed to give to avoid food allergies. As you are introducing foods to your baby, trust yourself. Listen to your “gut.” This is my advice in all parenting choices. Yes, it is good to know what is recommended, but the medical community obviously does not have all of the right answers. 8 years ago, if you gave your baby strawberries, peanut butter, or milk before a certain age, your child was sure to have a food allergy to that food. Today, if you don’t, your child is at a higher risk to have a food allergy to those foods. Here is my point. Recommendations change and change rapidly. Do your research and then decide what you think is best for your baby. WHAT AGE TO START SOLIDS? The recommended age to start is something that changes quite often. It has changed a number of times in the 8 years I have been a parent. In the early 1900s, recommendations were to wait until after one. Not too long ago (30-50 years), recommendations allowed for as early as 4 days old. They are back to saying four months is okay, but you don’t need to start at four months. The range is typically 4-6 months–there is debate on whether 4 or 6 is best. Again, go with what you think is best. The best thing to do is start when your baby seems very interested in eating solid foods. I have started my babies when they have started leaning toward food we are eating at meal times with their mouths open. A huge indicator in if your child is ready or not is when the natural tongue-thrust reflex goes away. Babies are born with the reflex to push things out of the mouth. Once baby loses that and is able to swallow (more than liquid), it is a good physical sign that baby is ready. Another physical sign is when your baby can sit unsupported. My recommendation is to first wait until 4 months old. You might prefer to wait until 6 months or later and that is totally fine. Then start to watch baby’s interest. When interest is there, analyze the tongue-thrust reflex. If it seems like baby could swallow food, give it a try! WHAT DO YOU FEED BABY? Things are simple today. Much more simple than they were with my first two. First, start with the simple foods that are universally easy on the tummy and are not foods people are usually allergic to. Many people like to start with some sort of cereal like rice or oatmeal. Other good first foods are sweet potatoes, bananas, and peas. Recommendations are now that if a baby has tolerated these simple, non-allergenic foods and is 4 months or older, you can introduce almost anything baby can chew (but do not feed a baby raw honey). How long does a baby have to have eaten foods to have “tolerated” them? I don’t know. I would recommend at least two weeks. For my babies, I would do 4 weeks of historically “safe” foods before I got adventurous. This article is a great read on introducing allergens. First, choose what food you want to start with. See above. Second, set things up. Have your food read. Have your chair ready for baby to sit in. Have your camera and/or video monitor ready. Have it all ready before you get baby sitting and waiting. Third, sit baby in the high chair/seat. Put the bib on. Fourth, pray with your baby if you are a family that prays before meals. Do this each time you feed your baby. Next, put a bit on the spoon. Make sure the food is a good temperature (not too hot). In detail, I described your first feeding session. No matter what food you want to introduce next, remember the 3-5 day wait rule. Wait 3-5 days between each new food so you can watch for allergic or negative reactions to the food. So do one food day one. Wait 3-5 days before you do a second food. Do that each time you introduce a new food. 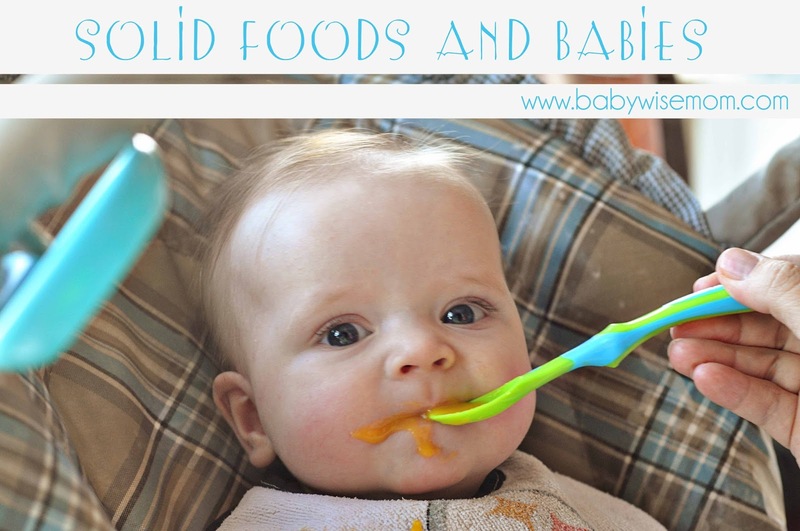 Do not introduce mixed foods (like, bananas and sweet potatoes) until your baby has had both successfully. Start with only about 2 tablespoons of food. Not much! See how that goes and then increase from there. Once you have baby eating 3 meals a day, the amount will vary from child to child. I have had babies that ate a whole lot of food and those who ate not so much. Let your baby guide you in deciding how much to feed her. For your first meal, choose a time of day that works best for you. I like to do breakfast or lunch so if an allergic reaction were to happen, it would hopefully happen during the day and not the middle of the night when I wouldn’t be at 100% capacity for dealing with a strange situation. Once you have all of those details down we have talked about so far, you want to start thinking about manners. Basically, when baby does something you don’t want her doing long term at the table (like thrusting her hand into a bowl of carrots), don’t freak out. If you have a very entertaining reaction, she will naturally want to see that reaction again. Calmly remove her hand, wipe it up, and let her know to not do it again. Then show her where her hand can go instead. With some things, I like to initially ignore the behavior. So if a baby starts blowing raspberries or does a nice high-pitched squawk, I just ignore it. If it continues, then I let the baby know to not do it at the table. HOW DO YOU AVOID PICKY EATERS? HOW DO YOU TRANSITION TO TABLE FOODS? The day will come when you and/or your child will want to move from purees to eating table foods or finger foods. You will want your child eating basically whatever the family eats. See these posts for tips.